If you are into beginning of using ZOO CCK, you might cause a question: how to assign elements to Apps? This tutorial will save your time. There are two core Apps (Blog and Pages) that has been added as an example. Just remember the template name you have selected since it will be required on next steps. It is default in our example. In case if the name has been forgotten or you are going to add new elements to existing site you always can change the template in App configuration (click on Config link). It is time to add elements. Click on gear icon to manage elements of the App. It is also can be called as App Config, but has another features. The App has various types of content related to specific features. By default there are two types in Blog: Article and Author. To the right there is a list of Template Layouts. We need to manage layouts of the template which was selected in App config (see above). In our case it was default template. 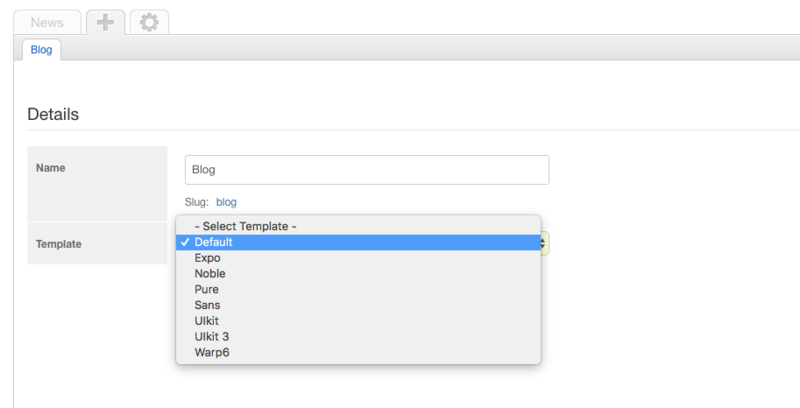 Now we can see a list of content types and template layouts. First of all, let's add new elements to the content type. Click on Edit elements link below the Article. On the right side you can see Element Library. Click on the elements which you want to add to the App type. 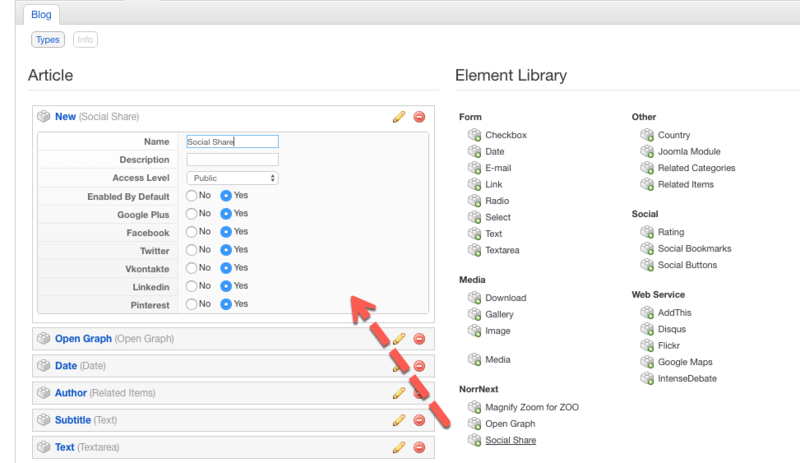 You also can configure elements here (see Social Share settings on the screenshot below). 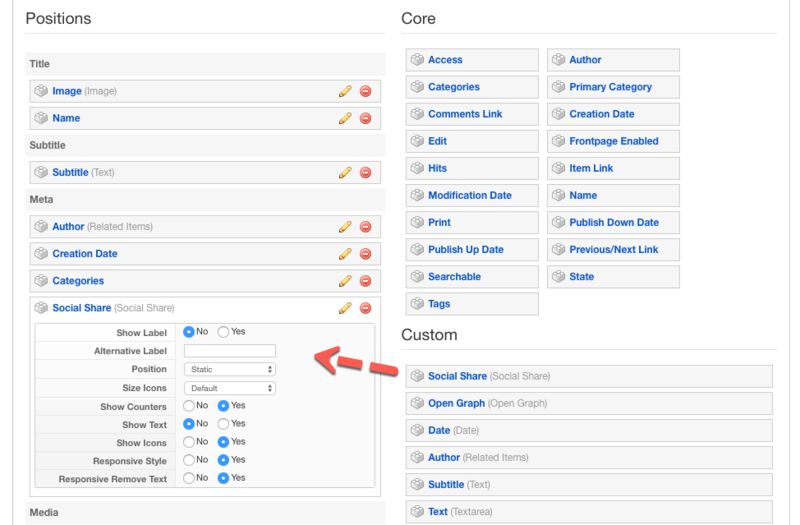 Let's add Social Share and Open Graph, give these elements a name, play with its settings and save the article type. Let's construct a new view: which elements should be displayed in the selected layout. Edit - edit layout in the item edit view. 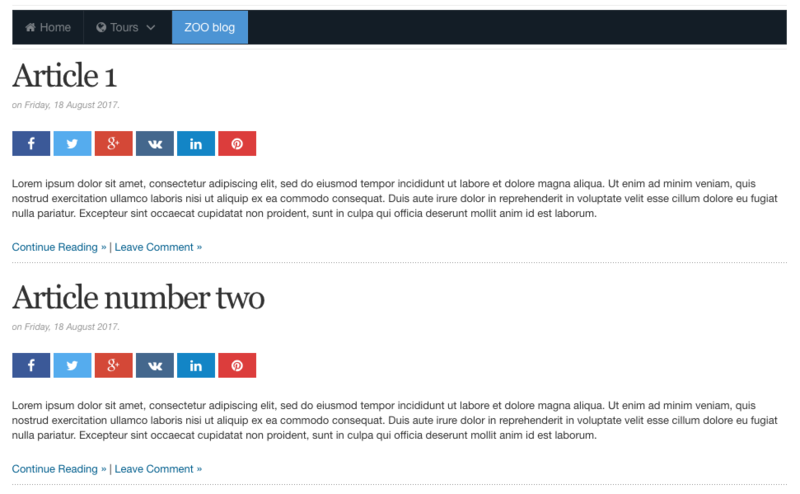 Feed - feed layout for all kinds of feeds like RSS or Atom. Submission - submission layout in submission view. Teaser - teaser layout in the frontpage, category, alphaindex and tag. In our example we need Full and Teaser. Click on Teaser. We see positions on left and elements on right. We can add required elements from right and assign them to the positions. Using drag'n'drop move Social Share element to the preferable position. Moreover, you can override its settings. You can add as many elements as it is needed. You can add any required element to be rendered on the teaser page. Let's add the same elements to Full page too and change some params to make elements looks different. Click on Full layout. Now add Social Share element with drag'n'drop and play with its settings to make it different from teaser layout. 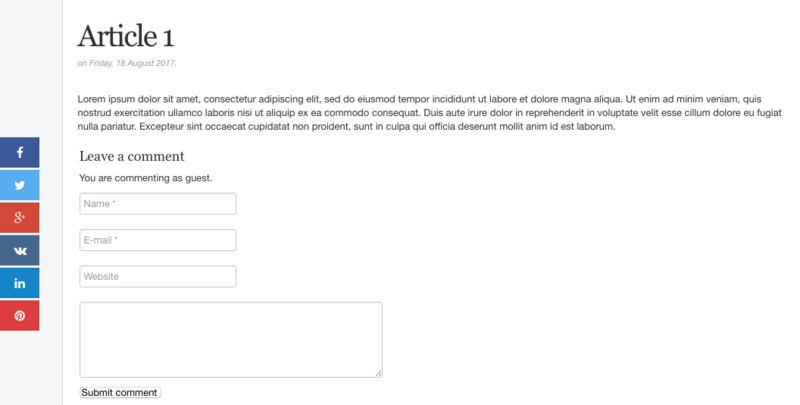 Using this approach you can add any elements to content types, then assign these elements to required positions and change its settings in each layout. As a result, you can customize layout views according to your needs.